Monhegan Island is noted for its interesting paths and walks, and that's mostly what there is to do—there are no roads. Old 19th-century hotels and guest houses provide lodging to guests who come for the old-time atmosphere, the quiet, the sound of the sea, the artistic opportunities, and the hiking paths that straggle across and around the island. 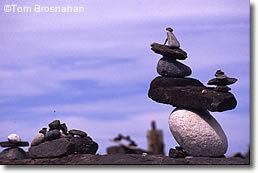 In the forests and on the stony shores, guests build little "fairy castles" of sticks and stones for others to discover and enjoy. 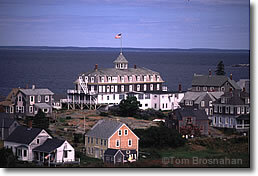 If you really want to get away from it all, Monhegan Island is the place. The Balmy Days is the sail-assisted motorboat that makes the daily run 16 miles out to sea to Monhegan. One trip out, leaving in the morning, and one trip back from the island, leaving in midafternoon, are made daily. You cannot stay overnight on the island without previous hotel reservations, but the Balmy Days's schedule allows you to have between 3 and 4 hours on the island if you go out and back in one day. While it's out at Monhegan, the Balmy Days makes one run around the island so you can see the rugged cliffs. By the way, you can easily hike all there is to hike (pretty much) in one 4-hour stay on Monhegan. For detailed information, visit the Balmy Days website. Above, inns and guesthouses from the 19th century. 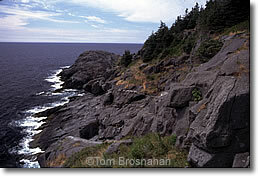 Below, the craggy shore of the Atlantic Ocean side of Monhegan Island, Maine. Bottom, a fairy castle on the stony shore.